With flash: Wet n Wild Haze of Love 215B megalast nail polish. There are very few things in this world that truly surprise me. For instance, I was not surprised when Ashton left Demi for ladies of his own age. I was not surprised when George broke-up with Elizabeta (my archenemy). I was not surprised when JLo announced her divorce from Mark Anthony and ended up with a 25-year-old boyfriend. What do you think will happen to that union? Writing on the wall people! However, I was surprised by Wet n Wild 215B Haze of Love Megalast Nail Polish ($1.99 US/.45 fl. oz.). This little gem was really an unexpected find at the drugstore. Natural Light: Wet n Wild 215B Haze of Love megalast nail polish. Long-lasting, opaque color provides 5 days of chip-resistant wear. A revolutionary resin polymer system creates exceptional color adhesion to nails. This resilient polish is calcium and mineral fortified to rebalance and prevent nail discoloration. Comes with a unique, full-coverage brush that glides on smooth for one-stroke application. Toluene, phthalate, and formaldehyde free. The color 215B Haze of Love is a plum red shade with a brown undertone; very flattering on warmer skin tones. In certain lighting Haze of Love pulls more brown than plum. This polish is a cream formula, has a medium consistency and glides on the nails very smoothly. The color builds up nicely in two coats without any streaks or bubbling in sight. The end result is surprisingly glossy. Typically, this sort of color would be featured in the Fall, but I must go against conventional style and sport this color in Spring/Summer. For those who are not as bold, Haze of Love would make an excellent pedicure color. Have I mentioned the price? 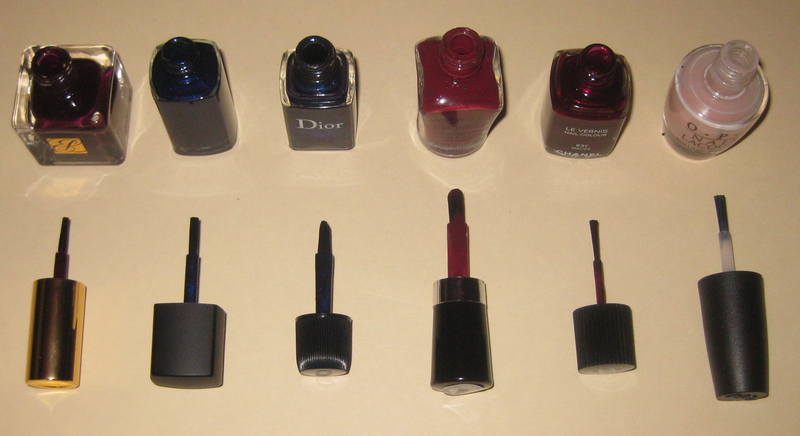 Two dollars is the maximum price for these polishes. I purchased mine at Rite Aid on sale for a whopping $1.29. Who doesn’t love a bargain? 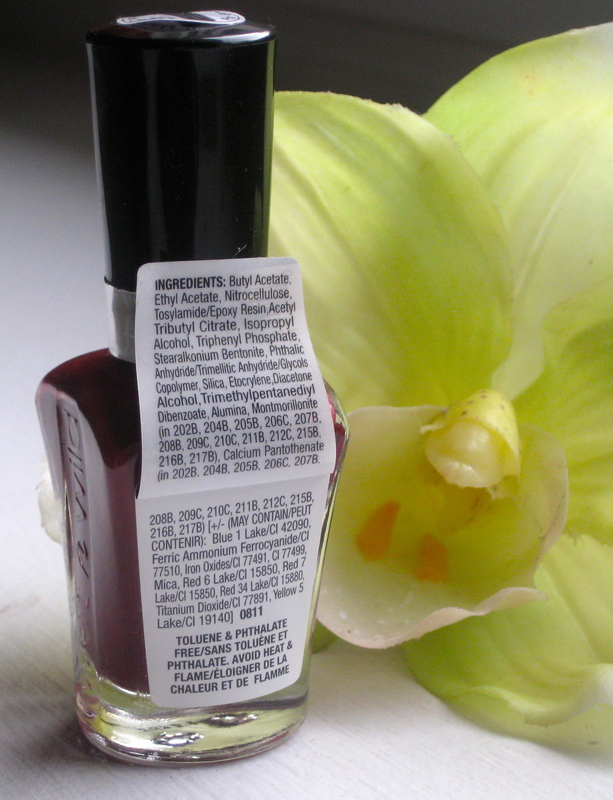 Wet n Wild 215B Haze of Love megalast nail polish ingredient list. This review would not be complete without careful examination of the brush. Wet n Wild megalast polishes have an absurdly wide brush. It is inconceivable to me who designed this “paint” brush. The nail polish industry realizes the importance of designing a brush with substantial girth; wider brushes equate fewer strokes, easier application and smoother results. Wet n Wild Megalast line has taken that idea and run amok. Brush Comparison: Estee Lauder, Rococo, Dior, Wet n Wild, Chanel, OPI. Will this deter me from future Wet n Wild Megalast Nail Polish purchases? No…but I can see people with short/narrow nail beds completely overlooking this line. 215B Haze of Love lasted on me just as long my Chanel polishes (four days). As always, wear time varies according to one’s activities. There are 18 colors in the megalast line. Wet n Wild is sold at Rite Aid, Harmon, Walgreens, CVS.com, drugstore.com, etc.. Makeup would tell you to go check out the sale on Wet n Wild this week at Rite Aid. Who will be able to resist a two dollar nail polish that performs just as well as high-end brands? The brush width does pose a problem, those with narrow nail beds will find application challenging. Wet n Wild 215B Haze of Love Megalast Nail Polish is worth a try and if you are not interested, bored, displeased, or unenthused, emulate our fellow celebrity misfits and wonder aimlessly seeking a replacement (for nail polish…not love) in a Haze of [Disgust]. Have you tried any of these polishes? Be well and stay safe.